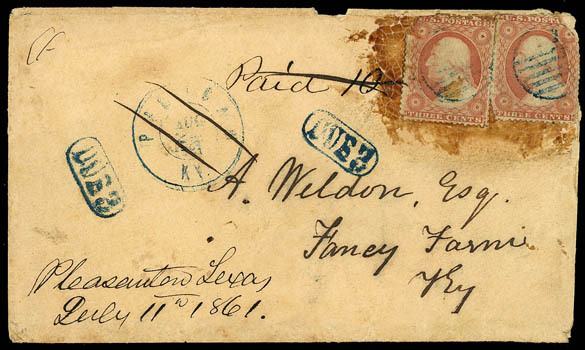 Confederacy, Independent State Covers, balance of three U.S. entires; with "Mobile, Ala., Jan 16, 1861" cds on 1857, 3¢ Nesbitt, "Charleston, S.C., Dec 29, 1861" cds and grid canceling 3¢ Star Die and blue "Petersburg, Va., Apr 19" cds and grid canceling 3¢ Star Die entire; all clear strikes on fresh entires, Very Fine. Confederacy, Virginia Stampless Balance, of nine covers; includes red Conrad's Store with "Paid" and "5" on U.S. 1857, 3¢ Nesbitt entire, Tudor Hall "Paid" & "5" with re-rate "10" struck over, Amelia C.H. 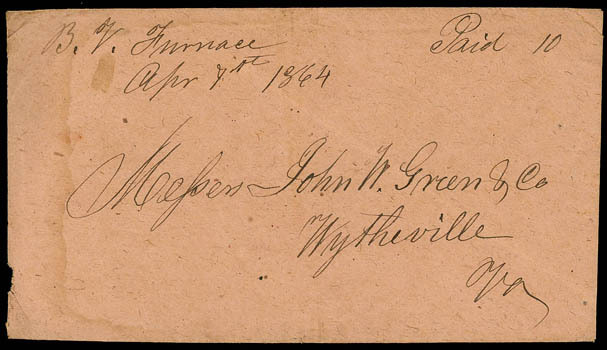 to Winchester forwarded to Richmond, red Petersburg on cover addressed to Charlottesville sent with express and dropped at Wytheville, Va. with additional townmark and "Paid 10" handstamp, Columbia manuscript, Marion and Danville Paid 5 usages, manuscript B.V. Furnace and Gloucester C.H. ; condition varied, Fine. Confederacy, The Weldon - Slayton Correspondence, 1849-68, fascinating family correspondence of 18 covers and original letters mostly addressed to Abraham Weldon in Fancy Farms, Ky. from son Vachel and son in law John Stayton who both settled in Texas in 1858; first three 1849 folded letters from Abraham's eldest son William from Elizabeth, Ark. (manuscript postmarks) with content regarding cotton farming and slavery, 1853 folded letter from his youngest Vachel in Cape Girardeau, Mo., next four letters from Pleasanton, Texas starting in 1859 from Vachel and John Slayton with interesting Feb. 5, 1860 letter from Vachel mentioning U.S. troops buying up forage and beef, Negroes scarce, Captain in New Orleans buying rifles, Rio Terio settlers and Dragoons fighting Indians on the Nunces River, etc., correspondence highlighted by cover and letter sent from Pleasanton, Texas in July of 1861 four months after Texas was admitted to the Confederacy; cover franked with U.S. 1857, 3¢ dull red, two singles and manuscript "Pleasanton, Texas, July 11th, 1861" postmark with matching "Paid 10" alongside stamps, cover eventually carried across the line and entered the U.S. mails with blue "Paducah, Ky., Aug 23, 1861" cds, two strikes of "Due 3" handstamp and grid handstamps cancelling stamps, with lengthy eloquent letter from John Stayton in part…Texas flour is cheaper than we ever bought Northern flour, and our State can furnish enough this year to bread the Southern Confederacy. Our frontier is quiet and all the posts on our frontier are garrisoned by Teas Rangers, instead of a lazy, worthless herd of U.S. Regular Soldiers who have heretofore consumed the money of the Government without giving us protection. There is now no political excitement in Texas, all has subsided, and a calm decided and defiant spirit actuates the people of this State. While we where members of the old Government we were loyal, but oppression and a fast ripening despotism have caused or compelled us to severe connections with these States in connection with which we furnished the most imaginative and successful government on earth and were fast advancing to the Empire of America, but not of the world., later P.O.W. 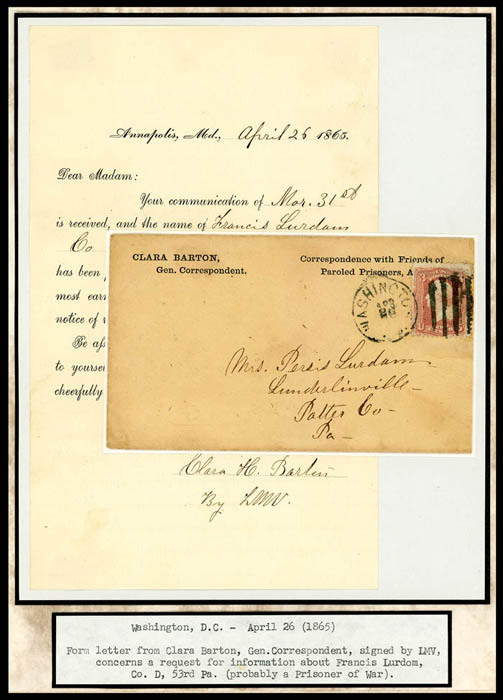 correspondence from C.S.A. Calvary Captain Vachel Wendon at Camp Chase, Columbus, O. (Feb. & Mar. 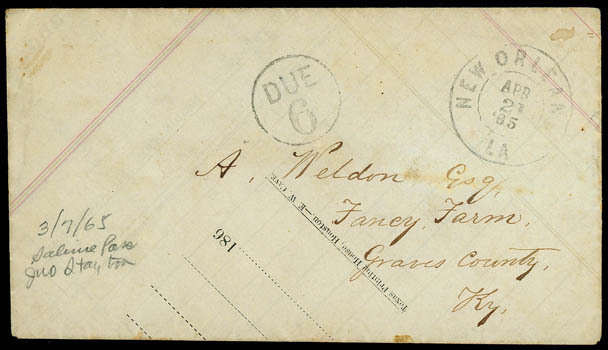 of 1863) and Delaware Fort, Delaware City, Del., latter Sept. 1865 adversity cover posted from occupied New Orleans, La. with letter from Slayton in Sabine Pass, Texas and others from both Vachel and John from Indianola, Galveston and Clinton; a wonderful historical correspondence spanning through the Civil War. John Slayton was admitted to the bar soon after settling in Texas where he practiced law. In 1858 he was elected district attorney of the 8th Judicial District and later served the Texas Supreme Court from 1888 to 1894. Confederacy, New Orleans, La. 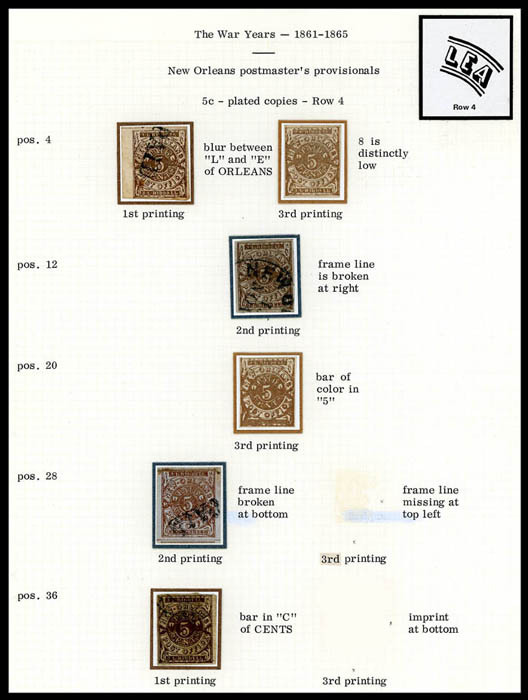 Provisional Issue Study, balance of exhibit, 30 mint or used copies (mostly 5¢ brown/red brown) all plated and with printings identified, various shades, etc., F.-V.F. overall, ex-Skinner. Scott No. 62X1-62X5 Estimate $2,500 - 3,500. 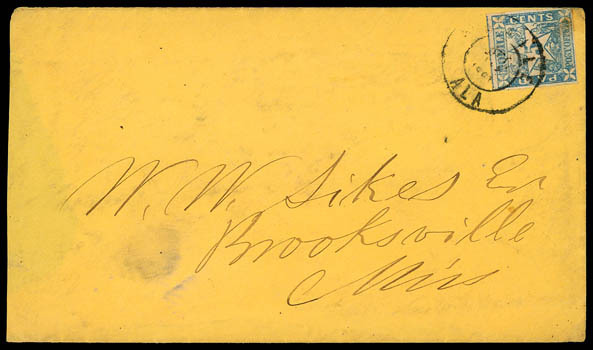 Confederacy, Postmaster Provisional Cover Group, of 8 covers; includes Greensboro, N.C. 10¢ entire (32XU1, only 8 recorded), Jackson, Miss 5¢ entire (43XU1, 34 recorded), three Mobile, Ala. 5¢ single usages (58X2, one with P.S.E. cert), two N.O., La. 5¢ single usages (62X3) and a Raleigh, N.C. 5¢ entire (68UX1); condition mixed, generally Fine appearance. Confederacy, The Gordon Bleuler Civil War Collection Balance, 7 volume collection neatly mounted and displayed on pages focusing much on Sanitary & Relief Organizations; over 250 items including dozens of unused Magnus covers, song sheets and cards including a series of carte-de-visite like cards featuring Confederate Generals, Sanitary Fairs including tickets, circulars, unused covers, and other promotional fair items, other used relief organization covers, including Clara Barton cover and enclosure (signed by her secretary), unused allover Volunteer & Cooper Refreshment Saloon covers, etc., also section of 16 unused Confederate patriotics and POW material, generally Very Fine. 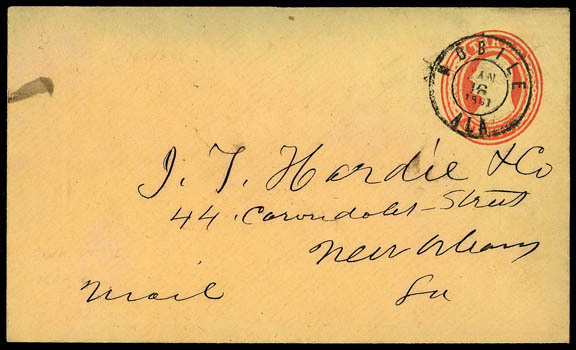 Confederacy, Regular Issues on Cover Group, of 29 covers; includes 8 #1 usages from towns including Charleston, S.C., Bonsacks, Va., Dandridge, Tenn., Newberry C.H., S.C., Mount Crawford, Va. with crossroad cancel (missing one stamp), pair use from Mobile, Ala., etc., #2a use from Macon, Ga., #3 drop in Charleston, S.C., four #4 usages including pair, three single #5 usages including one from Okolona, Miss., #6-7 pair usages with railroad (missing one stamp), three #8 drop usages from Richmond Va. (2) and Montgomery, Ala., two "TEN" (#9) usages including homemade cover from Gordonsville, Va., #11-12 usages including a #11 strip of 4 quadruple rate use, also included a Buckingham Female Institute allover shade ad cover (missing stamp); condition varied, generally Fine or better. 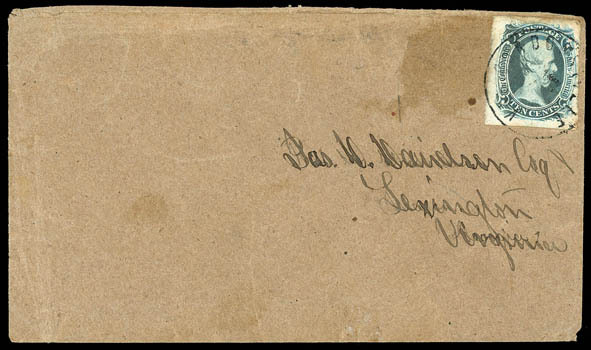 Confederacy, Confederate Cover Balance, of 23 covers; includes five stampless items including Cobb's Legion soldier correspondence including a enclosure, couple semi-official imprint covers including "Auditors Office P.O.B." turned cover and Subsistence Department imprints, manuscript Estillville, Va. usage with "Paid 5¢" over U.S. 1857, 3¢ Nesbitt indicia, regular issue usages including three #1 usages, #2 use from Cleveland, Ten., #4 single and pair use, couple #5 usages from Columbia, S.C. (blue townmark) and Richmond, Va., five 1862, 5¢ Jefferson pair usages including turned use on U.S. 1857, 3¢ Nesbitt entire, and four later 1863, 10¢ issue usages including with couple colored town cancels, generally F.-V.F. 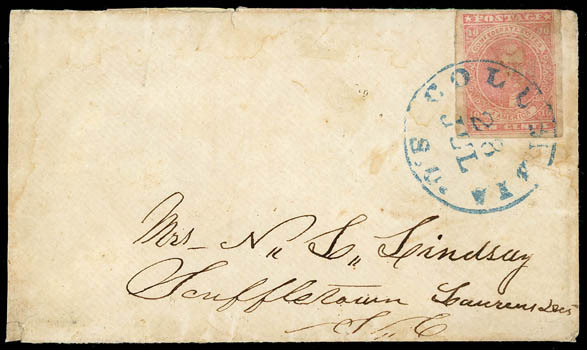 Confederacy, Cover Balance, of 12 items including a couple fronts; including Provisional with Charleston 5¢ blue usage (16X1, cat $2,500) and a #16XU1 rebacked front, Atlanta, Ga. 10¢ forwarded entire (6XU6, corner repair), some interesting stampless usages including soldiers letter from Kinston, N.C. without postage indicated (with article), Ridgeway, N.C. fancy boxed "Paid 5", "Selma, Ala., Dec 10, Paid 3" cds with "5" re-rate in pencil and portion of U.S. 1857, 3¢ dull red torn off cover, regular stamp usages including two #2 usages from Chattanooga, #5 10¢ deep rose usage (with C.S.A. cert), etc. 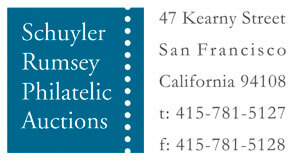 ; condition varied, a Fine group. Confederacy, Confederate Cover & Ephemera Group, group of 25 covers and some additional collateral items; with couple early stampless, stamped covers with issues including Scott #1 (3), 4, 5, 6 (4), 11 (2), 12 (6), 13 (with cert), also 8 carte-de-visites with a few tin types; condition mixed, please inspect.